Here are many fine websites about Joan. This one here is more personal and created by a student, Carolie Wolf. Carolie sees Joan as a medieval version of Katniss Everdeen, from The Hunger Games trilogy. 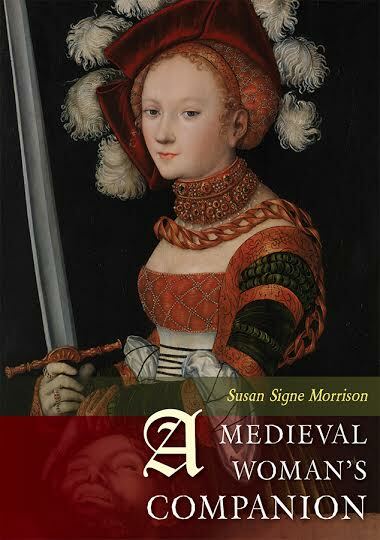 Perhaps Joan was a model for this 21st century warrior and young woman defending the people she loves. Carolie also shows how Joan is connected to the film Frozen. 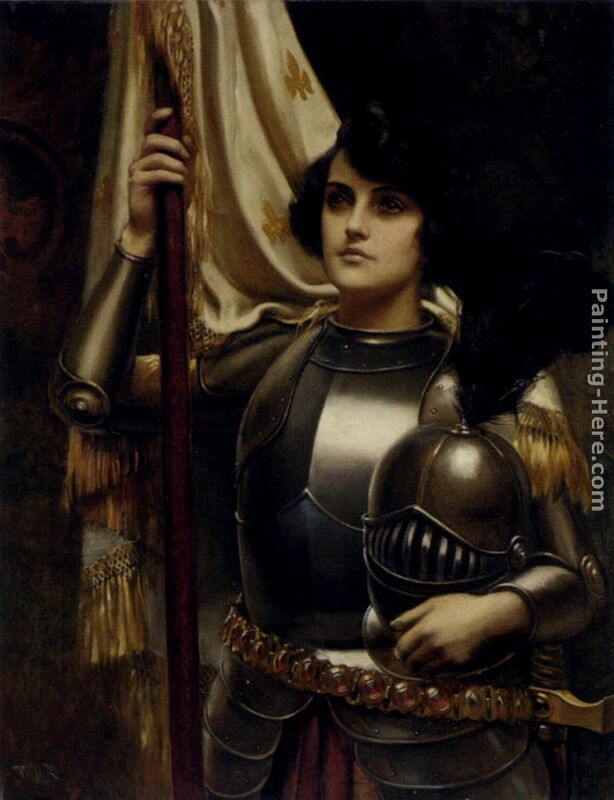 Joan of Arc with her banner and in full armor. Painted by Harold H. Piffard. Patron Saint of: France ; martyrs; captives; military personnel; people ridiculed for their piety; prisoners; soldiers. 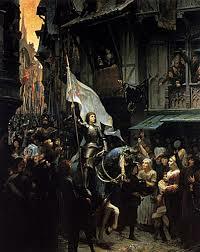 Joan of Arc is the Katniss Everdeen of her time. She is definitely is one bad chick. She accomplished so much in her short time alive, and meant a lot to men and women alike, even though she was burned to death at age 19. Joan of Arc was born to a family of peasants, and not much after that is recorded, but the important part is she had visions of angels and heard voices that would tell her to save her country, and all of her family and town told her not to pursue these visions for the longest time, and then eventually, when she decided not to give up her faith, they finally supported her and some rich people who lived near her gave her money to go to Chinon, France to see the king, King Charles the seventh. 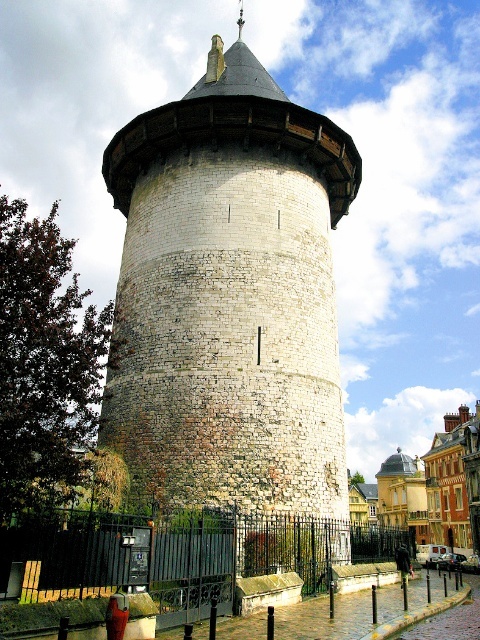 Charles believed her that she was hearing the voices from angels and, since it was the middle of a war (the Hundred Years War), he decided that he would let her lead 5,000 men into battle, which would be called the Seige of Orléans, where Joan led her men to victory over the English, which gave her the lasting name of The Maid of Orléans. Joan on her horse before leaving for Orléans. Painted by Jean-Jacques Scherrer. After that she led her men through a few more successful battles, driving the English to the far north of France, and then eventually got shot with an arrow and captured by the Duke of Burgundy, Philip the Bold, at Compiègne and then sold to the English. After her capture by the English, Joan was tried for witchcraft, heresy, and dressing as a man. She was locked in a tower at Rouen and she still stood by her beliefs, and never gave up her faith even though it could save her life, she still stood by her visions from angels. The charges for witchcraft didn’t stick, after Joan was interrogated by English priests, but being that she still was a leader of the French army, they kept the charge of cross dressing and heresy (for saying that she had direct communication from God) and was burned at the stake on May 30, 1431, at the age of 19. Pope Benedict XV canonized Joan on 16 May 1920. The people who came after her in the five centuries since her death tried to make everything of her: demonic fanatic, spiritual mystic, naive and tragically ill-used tool of the powerful, creator and icon of modern popular nationalism, adored heroine, saint. She insisted, even when threatened with torture and faced with death by fire, that she was guided by voices from God. Voices or no voices, her achievements leave anyone who knows her story shaking his head in amazed wonder. 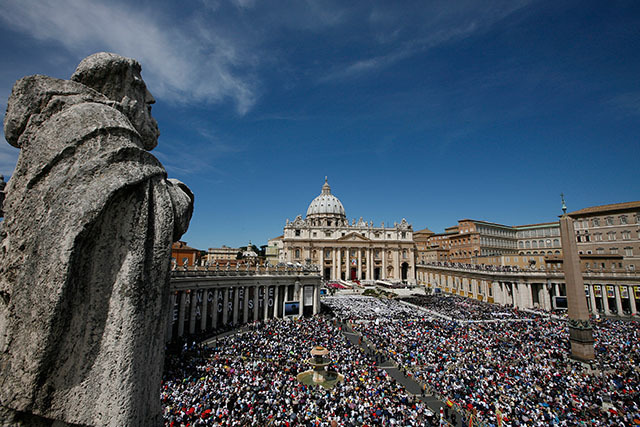 Canonization is just the process that the Catholic church has to go through to make a holy person a saint. A saint (click there to see the saint of the day, or explore on the site to read more about saints. There’s even a patron saint of television!) is just a person recognized by the Catholic church that possess holy qualities that Catholics can look towards for guidance, or pray to for specific reasons, like if they loose something (St. Anthony of Padua), or even something random like bee keepers (St. Ambrose). There are four steps to canonization, and this is just going to be a very brief summary, but click on the link here for the Wikipedia page. It begins at the local level where the eventual saint was either buried/burned/died and usually a bishop (the leader of all the churches in an area) will propose the idea of a certain person becoming a saint. The pope (leader of the catholic church for the whole world) can also recommend someone to start the process of becoming a saint. 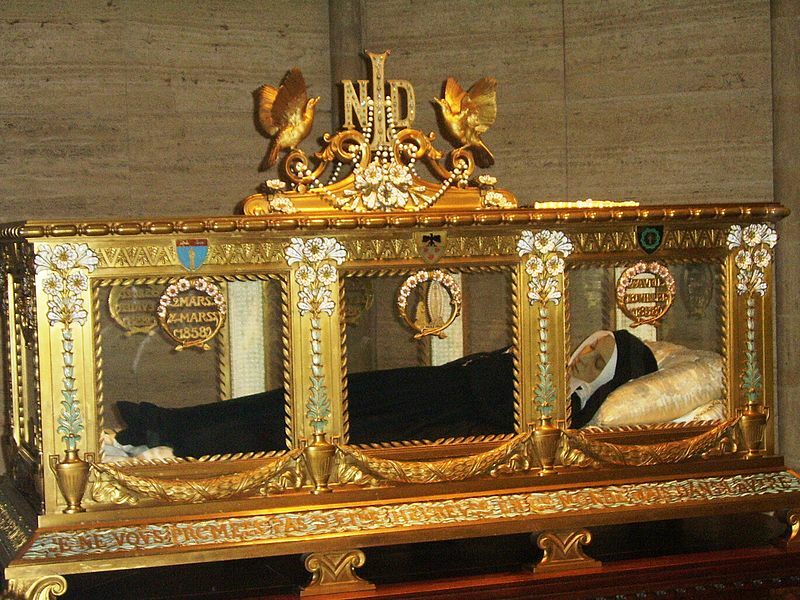 Saint Bernadette’s body on display in Nevers, France. It has not decayed, but a layer of wax was placed over her face to cover some skin patches for presentablility. “Blessed/beautification”: for the “venerable” to become “blessed” they must either be a martyr or a “confessor.” If they’re a martyr, meaning they died for what they believed in, they’re good to go on to try and be a saint. If they aren’t, they must have confessed to their faith, and that means God showed them a sign, maybe in the form of a miracle, which most of the times are miraculous cures to diseases. “Saint”: after these have all been confirmed and lastly they must must prove that there were at least two miracles after the saint has died, or just one more if to be “blessed” there was a miracle, which can also be a miraculous cure when this saint is being prayed to. And for a miraculous cure, it must be non-treatable or terminal (deadly) and the illness doesn’t ever come back. Joan of Arc is still a huge influence on people that she gets mentioned often in media, whether making fun of the fact that she got burned at the stake, or the fact that she is a strong women that overcame what was expected of her as a woman and led her country to win many battles. “Another realization about Frozen: Why they showed the painting of Joan of Arc. I’d often remember Joan of Arc’s story whenever I see her. And we all know that movies always have little bits of details which usually refers to something in the film. This is actually funny, British humor for the win. 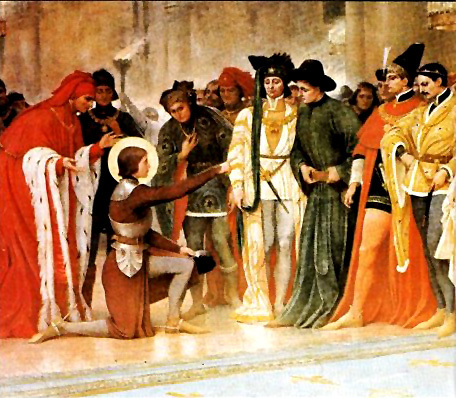 If you want to check more of these out, click here, there’s a whole list on Wikipedia of every time Joan of Arc is written about, sung about, sculpted, painted, and mentioned in television shows! Richey, Stephen W. Joan of Arc: The Warrior Saint. Westport, CT: Praeger, 2003.